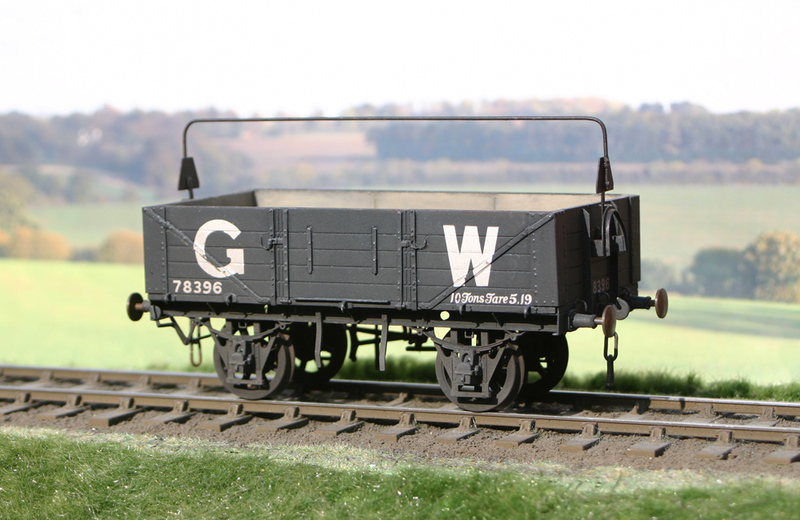 GW goods wagons part 1; 5-plank open merchandise – addendum. Just an update on this earlier post with some better photos as promised. This time I was able to use natural light which makes a big, big difference. Basilica Fields is a 7mm model of a railway set within the context of the East End of London… a “what if” railway with a supporting history which is sometimes somewhat different to the expectations of academics and historians of all persuasions. 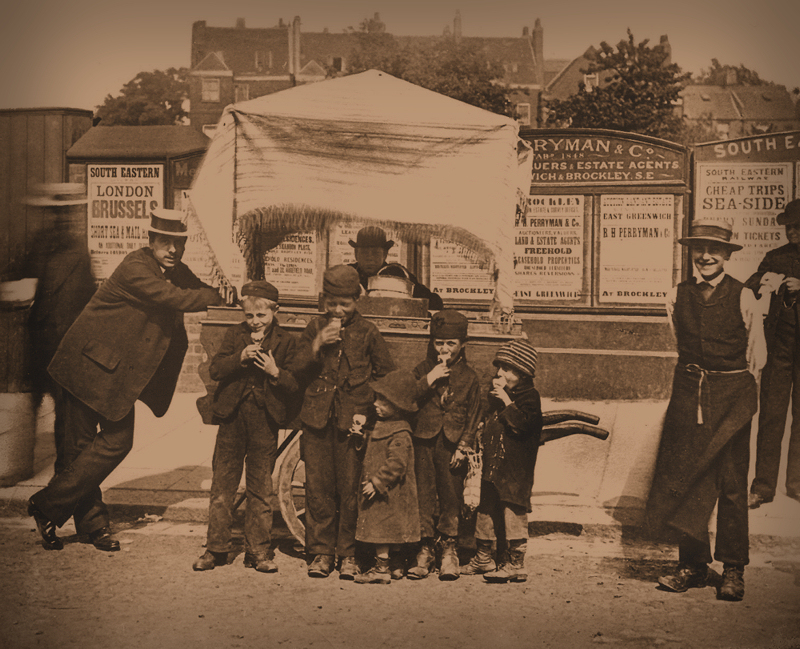 Within the world of Basilica Fields there are several, separate, “scenes” which represent different railway locations in the vicinity of Bishopsgate – Artillery Lane is the first scene to be brought before the public gaze. The railway history of Basilica Fields is set in late Victorian / early Edwardian days and this brings a pleasing benefit in that the model shall present railway services from up to seven railway companies running on the tracks of just one or two, or maybe, three pre-grouping railways. 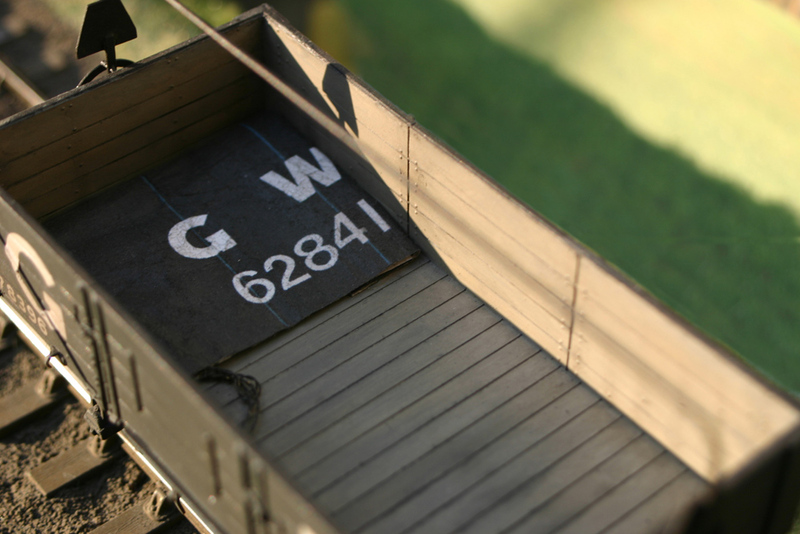 The permanent way for Basilica Fields is built to S7 standards – 7mm scale modelling with a track gauge of 33mm, (Scaleseven track and wheel standards). There is no “S7 equivalent” to buying a box of “O-gauge track” over the shop counter so all of the permanent way for Basilica Fields is hand-built. As the S7 standards for track are generally independent of company…. 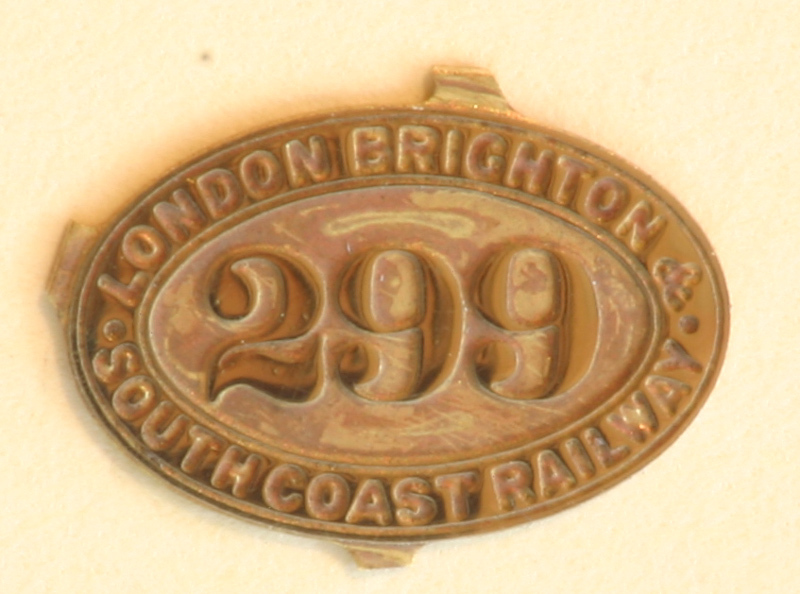 and track has to be constructed to represent the permanent way of at least three pre-grouping companies (Metropolitan Railway, Great Western Railway and Great Eastern Railway)…. then this post describes the construction of plain track in a generic way. Where the 7mm track has a feature which is company-specific then that feature is covered within the descriptions of the prototype permanent way; so for example:- the use of a jig to provide sleeper spacing is described here whilst the details of the sleeper spacing are to be found in the respective descriptions of Permanent Way. So where to start? Perversely, with the end product so as to explain the philosophy behind preparation of parts. I have been making S7 track for at least five years and what follows represents my approach to achieving a consistent result and where the initial colouring of the components has been achieved before assembly. The appearance of the track panels at this stage is “clean”…. 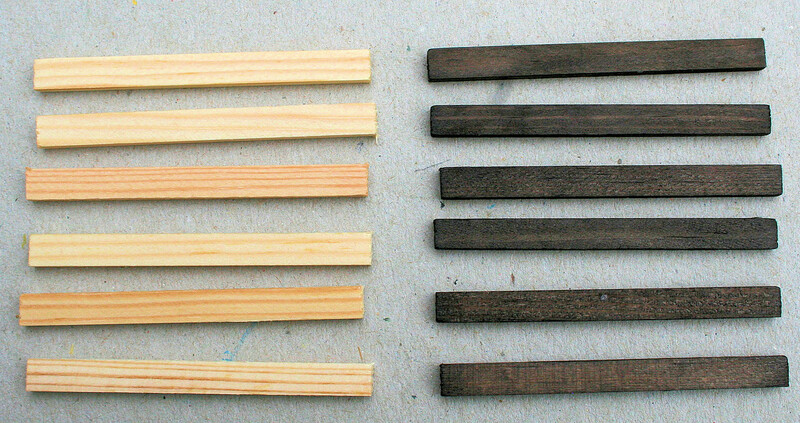 colouring of components before and weathering after assembly is easier than assembly/laying/painting in place. All of the weathering is to be done after the track has been laid and the techniques are to be covered in a separate post. The sleepers are made from Lime and are of scale 9′ x 10″ x 5” dimensions. The sleepers for Basilica Fields are supplied ready-cut from Perfect Miniatures. The colouring process uses shoe dyes with IPA to let down the intensity of the dye and as a medium when the sleepers are immersed in the dye. Much of the track of Basilica Fields is set in brick-lined cuttings where the sun shines on the track for just a few hours of the day, so the initial staining of the sleepers represents timber which has retained something of its original colour and yet appears to be damp and dirty. 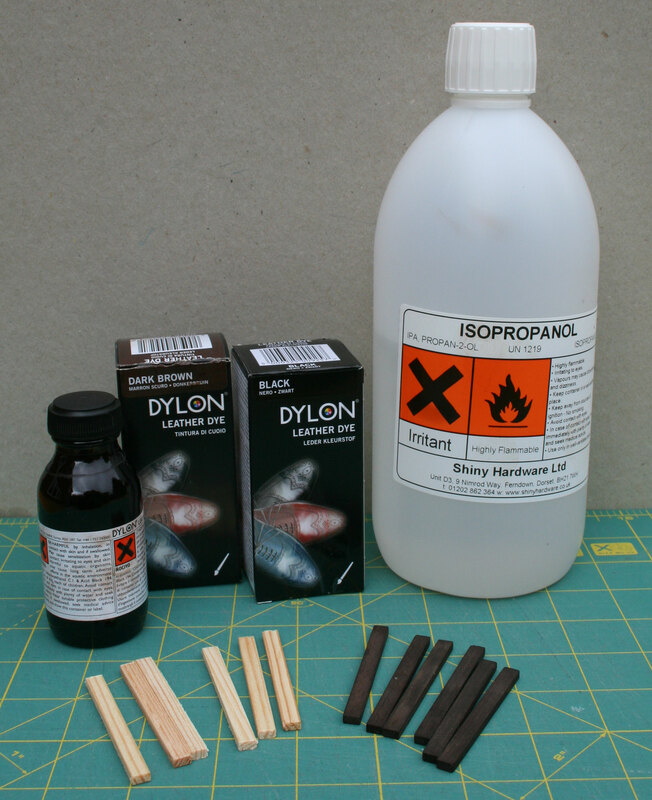 The initial stain is a 10% by volume solution of the brown dye…. with several “dips” to build up the colour. After the sleepers have attained a deep brown colour the damp and dirty colouration is applied by immersion in a solution of 10% brown and 10% black by volume. The stain solution is made up in a plastic tub, the sleepers dropped in and the tub agitated (gently!) to ensure that the sleepers are covered and wetted all over. After five minutes in the solution the sleepers are drained using a metal kitchen sieve (retained for the sole use in staining) and then left to dry on newspaper… with the drying sleepers being “tumbled” occasionally to promote the drying process and to avoid a blotchy appearance. Now on to the chairs… in this case the chairs are from the C&L Finescale range as being similar to those used by the GWR circa 1895, (see the drawing in GWR PW for Gun Street). Enamel paints (Humbrol) are used for painting the chairs with the “dirt and weathered rust” colour from a palette of black, brown and gunmetal (33, 133 and 53 respectively). 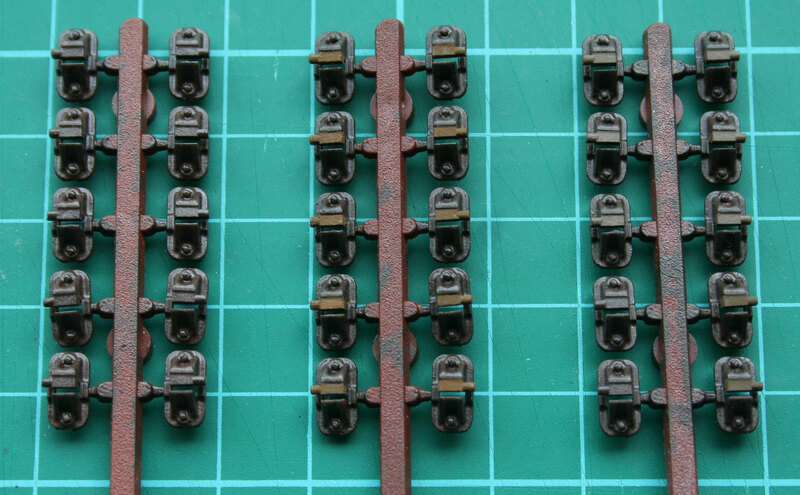 The oak keys are then painted using a mix of “track dirt” and “rusty rails” (Precision Paints). Keen-eyed readers will spot that the chair sprue has chairs with keys to the left and chairs with the keys to the right…. this difference between “LH” and “RH” chairs is important when fitting chairs to the rail. Sleepers are loaded into a jig which enables sleeper spacing along the rail to be replicated for each new panel; in this case all of the sleepers are the same width (GWR – 10″), where a track panel has wider sleepers at the ends then that increased width is accomodated within the appropriate jig (Met. Rly. – 12″). Chairs are slid onto the rail, which is blackened chemically, with care taken to ensure that the keys are aligned correctly for the intended use of the track panel (and with the keys of the outermost chairs arranged so as to be “driven” towards the fishplates). 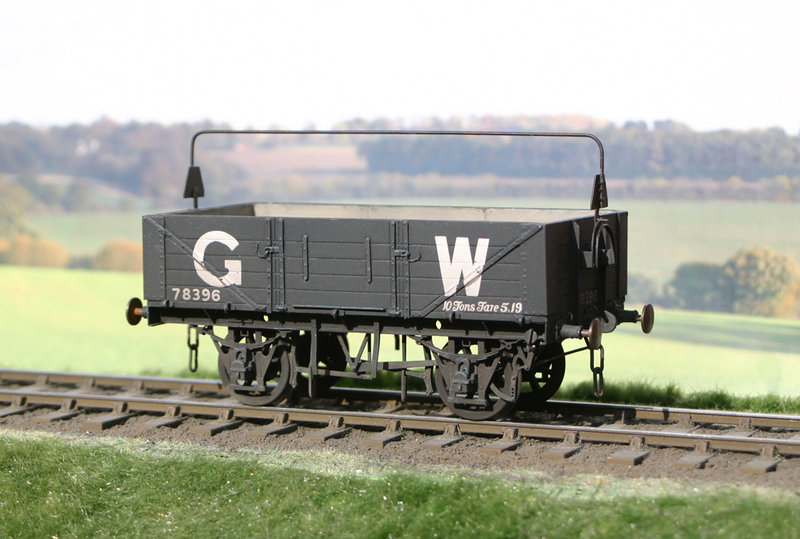 The rails are held at 33mm apart by S7 Group track gauges – available from the S7 Group stores and a benefit of group membership. The chairs are fixed to the sleepers by Butanone which is applied by brush on eitherside of a chair where the chair touches the sleeper. The chairs are moulded in ABS and that plastic is soluble in Butanone. The solvent runs into the gap between the chair and sleeper, dissolves the base of the chair and the resulting ABS “gloop” gets drawn into the grain of the sleeper (by virtue of the solvent which has been absorbed by the timber). The jig is a piece of 3/4″ chipboard upon which is fixed a distance piece cut from 4mm MDF – the MDF is 55mm wide and less than the length of the sleepers (63mm). Thin, 1/16″, ply spacers are glued on top of the distance piece – the width of the spacers is such as to place the sleepers at the required centres. The sleepers extend beyond the distance piece so that an assembled track panel can be removed by raising all sleepers at the same time rather than sliding the panel sideways (if a sleeper sticks as a panel is slid sideways then that “sticky” sleeper can impart a twisting moment to the bond between chairs and sleepers). 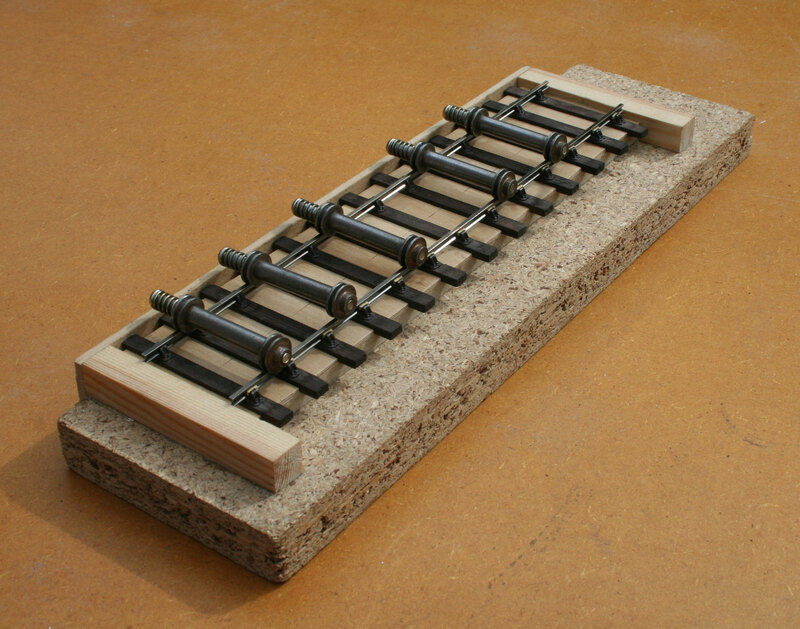 “Here is one I prepared earlier”… a representation of a GWR track panel with 32′ rails, 13 sleepers and appropriate chairs and fishplates (as in the GW PW post referenced earlier). 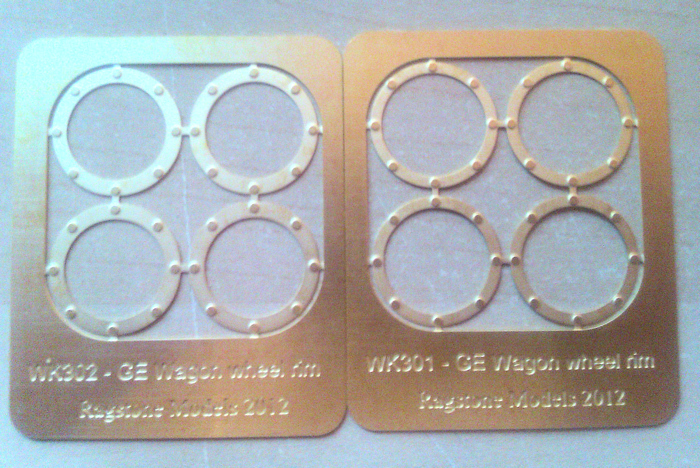 One of the benefits of 7mm scale modelling is that parts are bigger and more detail can be included. Exactoscale locking fishplates are fitted to the track here, these fishplates are moulded in ABS and hence provide insulation between rails. Each moulding has bolt heads on one side, and nuts on the other side, of the moulding. The light colour of the keys allows the placing of the keys to be seen with the outermost chair placed so that the key is “driven” towards the fishplate.